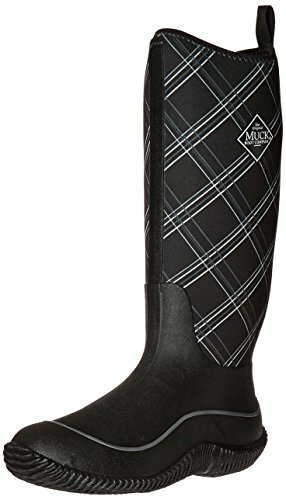 Great looks and reliable protection make Muck Hale Multi-Season Women's Rubber Boots a fashionable and functional choice for any season. These 100% waterproof women's boots feature a lightweight 4 mm neoprene bootie for extra comfort and flexibility. Built on a women’s last, these outdoor boots are designed to cater specifically to the contours of the female foot. On the inside, the mesh lining keeps active feet cool and dry all day long. A pull tab makes for easy on-off, and the self-cleaning outsole is ribbed to provide added stability in outdoor conditions. A comfort rating from subfreezing to 65 °F (18 °C) makes these versatile women’s rubber boots a smart year-round choice.